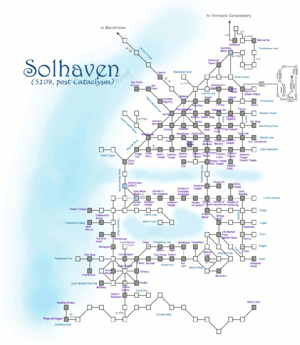 Solhaven is a major port city of the Barony of Vornavis at the northern border of the human-ruled Turamzzyrian Empire. While it is not one of the three drop-off points for new characters, Solhaven is still very welcoming to all adventurers. Geographically, Solhaven has an overland connection to Wehnimer's Landing that is easily traversed in a few minutes of real time, so it is a good place for those who prefer a less crowded environment but still want be able to make use of Landing services when needed. For a small fee, a Chronomage day pass can be purchased which allows for unlimited round trips between the two towns (from the Landing travel office: ASK ATTENDANT ABOUT SOLHAVEN). Day passes may also be purchased for trips between Solhaven and Icemule Trace, bypassing the dangerous trail through the northern glaciers. A smuggler's ship outside Solhaven makes hourly trips to River's Rest. The North Market is the traditional gathering place for adventurers. As Solhaven is part of the Turamzzyrian Empire, humans enjoy preferential treatment in many local establishments while elves of all kinds are not well liked. All standard town services are still available, but elves will have to pay more. Solhaven is divided by an inlet into north and south halves. The north district is considered the more commercial part of the city and has most of the town services. Outside of Solhaven proper, a few shops can be found in the hamlet of Marshtown.